Non Profit & Art Events Happening in July! “Precision Beauty,” the Moraga Art Gallery’s new exhibit, features interpretations of nature in the form of jewelry by member artist Kuniko Kay Nitta of Walnut Creek and watercolor paintings by Berkeley’s Karen Kramer. Running through August 11, the show also includes work by the gallery’s 13 other members. The gallery is located in the Rheem Shopping Center, at 522 Center Street, Moraga. Its hours are Wednesday through Sunday from 12 noon to 5:00 p.m . For more information, visit www.moragaartgallery.com or call 925-376-5407. Science can take you anywhere! A Lafayette Library "Full STEAM Ahead" program and part of the Library’s Reading Takes you Everywhere summer reading celebration. Start your 4th of July celebration early and join us for a special program on Rocketry. Design and build your own paper-based, duct tape rocket and see how high you can launch it. Several safe, air-powered rocket launchers will be on hand. Bring your hats and sunscreen as we will be outside. Register here. 7:30 Pancake Breakfast, 7:55 Flag Raising, 8:00 Haley’s Fun Run for a Reason, 9:00 Book Sale, 10:00 Parade Begins, 11:30 Party in the Park. For more information visit www.orindaparade.com. View Flyer. Join hundreds of Moraga residents at Commons Park for the annual 4th of July Celebration including pancake breakfast, family fun runs, dog parade, community booths, jump houses for the kids, a family magic show, and a live concert at the bandshell with David Martin's House Party! BUY-A-ROCKET and help the community raise $30,000 for the fireworks show! Donate online or send your check, made payable to the Town of Moraga to: Town of Moraga, Attn: Buy a Rocket, 2100 Donald Drive, Moraga, CA 94556. Learn more here. Every year the Campolindo Track and Field and Cross Country programs sponsor the Moraga 4th of July "Fun Run" event. These races kick off many of the activities that are part of the Town of Moraga's 4th of July celebration. The net proceeds from these runs again will be going to the Campolindo High School track and cross country teams. For more info and to register visit www.MoragaFunRun.com. Help a Foster Child Get Back to Being a Kid. Become a CASA Volunteer. You have the powerful opportunity to impact the life of a vulnerable child when you volunteer with CASA of Contra Costa County. CASA volunteers may be the only reliable and stable presence in a child's life to help encourage, support and motivate them to keep going. Learn more. Sign up to attend in-person Informational Session. Please join the Rotary Club of Lafayette on July 14, 2018 at the Lafayette Reservoir to show support for our active military, reserves, veterans and Gold Star Families who have lost their loved ones who served bravely for our country. Twilight Concert and Picnic featuring The High Water Line (bluegrass band) and The Big Band of Rossmoor. All active military visiting and on-leave are welcome. We will pay special tribute to our Gold Star Families and Blue Star Moms. Joining us will be Blue Star Moms Chapter 101, Danville and the Contra Costa Blue Star Moms, Chapter 20, Concord. Bring a blanket, your lawn chairs and a picnic. Learn more here. Town Hall Theatre is excited to announce its annual Donor Thank You Event, a one-night only performance of the original and inventive documentary musical GONE MISSING, created by The Civilians, with music and lyrics by Michael Friedman. GONE MISSING will have one performance only on July 14, 2018, at 8pm, at Town Hall Theatre Company, 3535 School Street, in Lafayette, CA. The event is free to all Town Hall donors, with a suggested donation of $20.00 for the general public. Seats can be reserved now through the Box Office at (925) 283-1557 or online at www.TownHallTheatre.com. Summer affords you the chance to see a range of work from gallery artists. Figurative, abstract, stone and ceramic sculpture, mixed media, and collage. Our Bay Area artists are ready to connect and offer you studio access. Contact us today to schedule a private viewing of all inventory with Jennifer Perlmutter, or a studio visit with one of our artists. Lamorinda’s Performing Academy, and Lamorinda Music. To learn more about Lamorinda Arts Council’s Arts in Bloom go to https://lamorindaarts.org/arts-in-bloom-festival. A sparkling new riff on the 15th-century morality play The Summoning of Everyman by Branden Jacobs-Jenkins, whom the New York Times calls “one of this country’s most original and illuminating writers." A finalist for the 2018 Pulitzer Prize in Drama, Everybody is Cal Shakes’ second official offering under the New Classics Initiative (NCI), exploring what it means to be a classical theater in the 21st century, and to allow living writers to expand our classical canon. Directed by Nataki Garrett making her Cal Shakes debut, Everybody plays July 18 – August 5 at the Bruns Amphitheater in Orinda. Low-priced previews take place July 18-20; Opening Night is July 21. Tickets (ranging from $20‐$92) are available through the Cal Shakes Box Office at 510.548.9666 or by visiting www.calshakes.org. Ticket prices are subject to change without notice. 27th Annual Swing for Shelter by Shelter, Inc. Enjoy a day of golfing followed by dinner and auction in Round Hill Country Club's fully renovated clubhouse with beautiful views. Golf in scramble format: men’s women’s & mixed teams. Not a golfer? Join us in the evening for our dinner and auction. Learn more and register at http://shelterinc.org/swing. Lafayette Community Foundation's (LCF) 10th Annual Senior Symposium, “Aging By Design” will take place on Saturday, August 4 from 8:30 a.m. - noon at Acalanes High School (Please Note New Location). Attendees will hear from a variety of experts about the latest findings on aging while maintaining independence. In addition, several vendors and non-profit agencies will have booths at the Symposium's Resource Fair providing information about their products and services. Attendance is FREE. Please register in advance by clicking here to fill out the attendee application and to have you name included in the raffle drawing. If you are a vendor/sponsor and would like to have a booth at the Senior Symposium, click here to fill out the sponsor application. 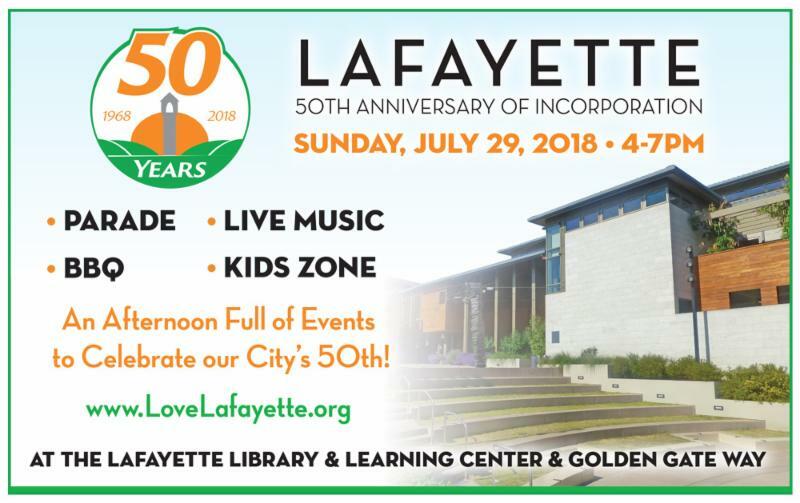 If you have questions, please email LCF at info@lafayettecf.org. 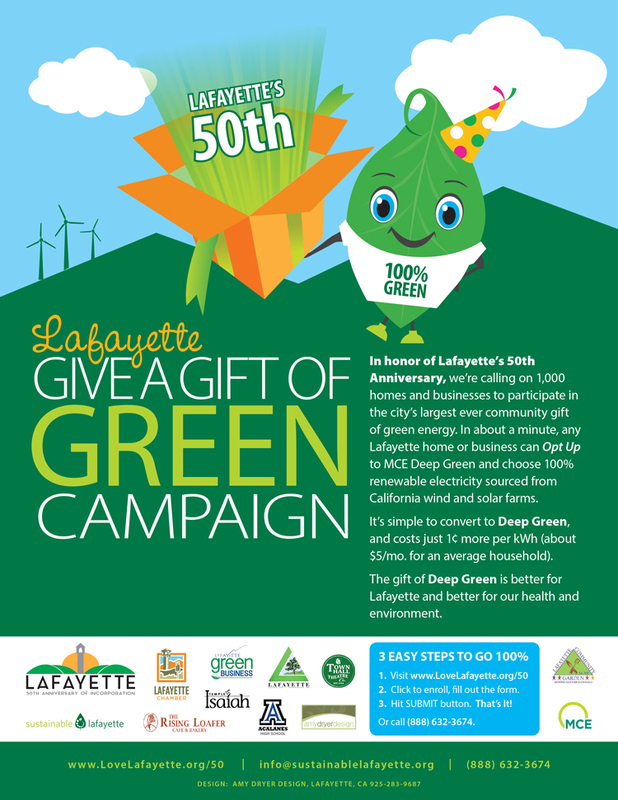 In honor of Lafayette’s 50th Anniversary, we’re calling on 1,000 homes and businesses to participate in the city’s largest ever community gift of green energy. In about a minute, any Lafayette home or business can Opt Up to MCE Deep Green and choose 100% renewable electricity sourced from California wind and solar farms. It’s simple to convert to Deep Green, and costs just $0.01 more per kWh (about $5/mo. for an average household). For more info and to enroll please go to www.lovelafayette.org/50. Mega Chamber Mixer, Wednesday, July 25, 5:30pm-7pm, Lafayette Veterans Memorial Center, 3780 Mt. Diablo Blvd. 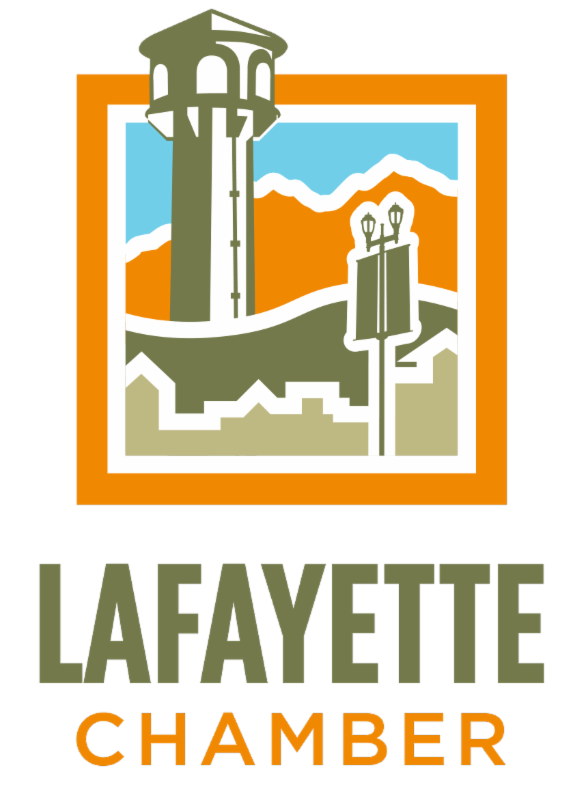 Lafayette Art & Wine Festival, Saturday, September 15, 10am-7pm & Sunday, September 16, 10am-6pm, Downtown Lafayette. 2018 Lafayette Res Run for Education, Sunday, October 21, Early bird registration now open!